Quote Roller has been running free for over 8 months, since the first beta version release. We hope you have enjoyed using the application for this period and now we have to announce that we are finally turning the billing on. We planned to do this on Nov 1st as it says on our website, however, we decided to let it go free for another fortnight. But don’t fret – we’ll still have a free plan for those who want more time to get more comfortable with the app. Accounts will be aligned with our pricing plans, in terms of quantity of proposals to be sent on a monthly basis, as well as the number of team members. 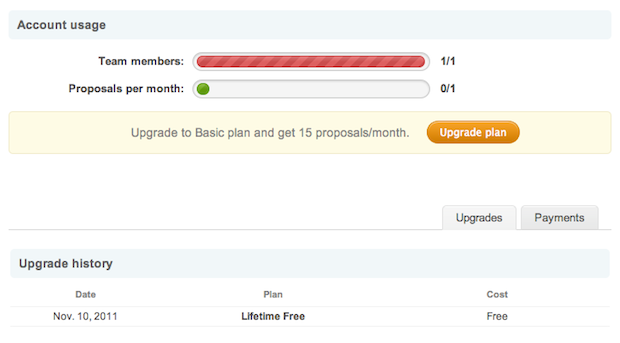 You’ll need to upgrade for a better plan if you are intend to use more than your plans limitations. We’ll need you to add a card and billing details to your account. If you intend to use a paid plan, your card will be charged the subscription amount for the following month. You will only be charged for the following month, not for past usage. Turning the billing on will help us to significantly improve the app and speed up the development process. We’re sure you’ll be delighted with the updates coming and some of the new features we are about to release. Soon, Quote Roller will get an iPhone app, deeper Freshbooks integration, a new pricing table, account and message customization, localization and many other things requested by popular demand. And, hey, you can still run Quote Roller on a free basis. Just by helping us develop the proposal templates library, or feature Quote Roller via your blog, or become one of the product’s evangelists. Contact us for details, we are keen to team up!